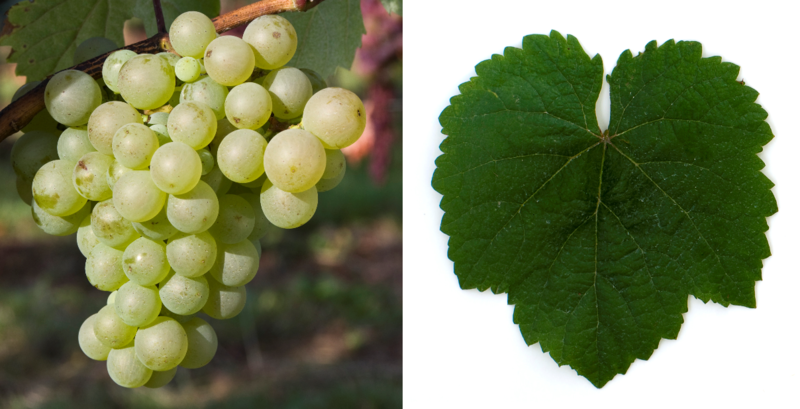 The white grape probably comes from Germany (or Switzerland ). The name may derive from the robust foliage of the vine, which is particularly powerful in the wind. According to another variant, this is a corruption of "Rußling" (soot), a term for "dark wood". To some extent confusing synonyms, which misleadingly point to other varieties, are Brauner Nürnberger, Dretsch, Drutsch, Drutscht, Dünnelbling, Frankentraube, Großfränkisch, Gros Räuschling, Großer Räuschling, Großer Traminer, Grünspat, Klöpfer, Luttenberger, Luttenbergerstock, Melon Blanc, Offenburger, Pfäffling , Pfaffentraube, Ruchelin, Ruschling, Rüschling, Silberweiß, Vigne de Zuri, White Räuschling, Weißwelscher, Zürirebe, Zürichrebe and Züriwiss. According to done in 2013 DNA analysis is a presumably natural cross between Heunisch ( Gouais blanc ) x unknown partner (previously became Traminer supposed). The Räuschling is not allowed, despite seemingly suggestive synonyms with the varieties completer (Zürirebe) or Knipperlé (Little Räuschling) be confused. An almost extinct game is Blue Räuschling (also Red Räuschling, Black Räuschling, yellowwood). The early to mid-season Räuschling vine is resistant to frost but something prone to Botrytis, It produces bright white wines with pronounced acidity and citrus flavors. In the herbal book of the German botanist Hieronymus buck (1498-1554) she is mentioned around the year 1550 as "Drutsch" or "Drutscht". The German Ampelograph Karl Friedrich Gok (1776-1849) described the variety in 1836 as Vitis fissilis (fissure = crack), because the berries rip slightly after rain in autumn. The name "Reuschling" first appeared in 1614 in the "Weingartordnung" of Count Philip Ernst von Hohenlohe-Langenburg (1584-1628) in Franconia. The variety was in Alsace, in the German growing areas Franconia. palatinate and Wuerttemberg, as well as in German and western Switzerland widespread. In Switzerland, she was before the time of Müller-Thurgau next to the Elbling the most common vine. Today she is almost only in the Switzerland on 23 hectares (12 of them around Lake Zurich), as well as in a small amount in Germany ( to bathe ) (Kym Anderson ). In the vine museum of the winery Leth (Fels a W. W., Lower Austria) are also a few sticks. This page was last modified at 15 January 2019 at 08:49.